Dataflow were a major software distributor for the Australian & New Zealand markets. This particular copy distributed on CD originally retailed for $199 AUD due to the academic use license. One obvious observation compared to other copies of Office, is that the retail box itself was particularly thin and light, similar to Microsoft Home multimedia titles at the time. No thick 500 page manuals here. Version 4.2.1 consisted of Word 6.0.1, Excel 5.0, PowerPoint 4.0, and a choice of using either Microsoft Mail 3.x or StarNine Mail as the e-mail client. Variations of the retail packaging were available, where all the manuals and a 30~ floppy disk set were included instead. Internet Explorer 2.1 and Bookshelf 1996-97 were also included in copies marketed towards small business. 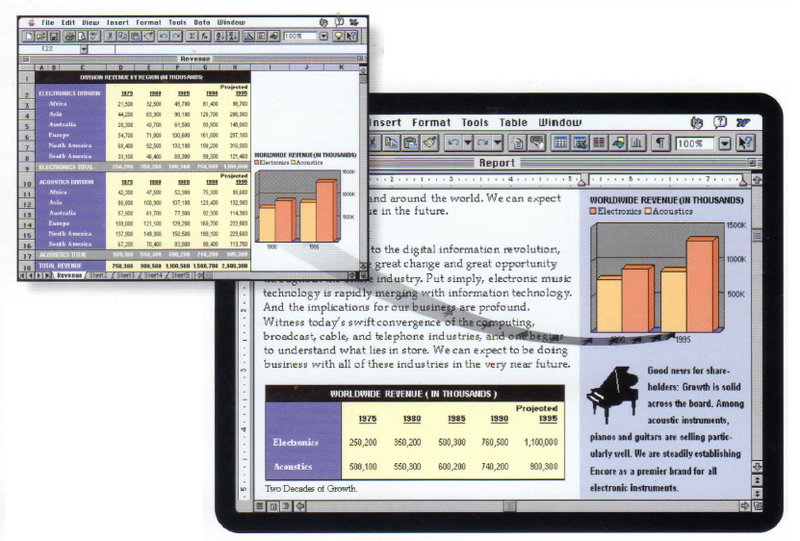 During the 1990s I hadn’t used Office on a Mac extensively, stuck with ClarisWorks at school. At home I used Office 4.2 on my Windows 95 PC, so to use the same version on the Mac felt fine to me, but regular users felt differently. Consistent feedback was that Office 4.2 was considered mediocre, mostly due to the user experience and sluggish performance. The applications were a direct port from Office 4.2 designed for Windows 3.1, and for Mac users this was particularly noticeable. The previous version of Word, version 5.1, in comparison was a favourite for many and would run on the original 68k Macs. Rick Schaut, a software design engineer who began working on Word 5.0 for the Macintosh and later subsequent versions, had written an insightful piece on his blog back in 2004. Although strictly focusing on Word 6.0, I would reasonably expect parts of it resonated with Excel 5.0 and PowerPoint 4.0 development. Around the same time, Microsoft Project 4.0 was released for both Windows 3.1 and System 7. Again the Mac version was a direct port from the Windows 3.1 copy. There appeared to have been some pressure for their software to be at feature parity between the two operating systems. Microsoft went quiet on Mac software development, until the Macintosh Business Unit was formed in 1997. This unit oversaw development of the next version, Office 98, which although similar to Office 97 for Windows, was more Mac-centric. From the back of the box, showing the use of OLE 2.0 between Word and Excel. It was the last Office available for 68k Macs, and the first to support the PowerPC natively. The minimum system requirements for Office 4.2.1 was for any Macintosh running System 7 that consisted of a 68030 processor, 8 MB of RAM, and 17 MB of available disk pace for the minimal installation. 62 MB was required for a maximum installation, while a 68040 processor with 16 MB of RAM was recommended. On a PowerPC, both RAM and hard disk space needed to be a little extra than this. InfoWorld’s November 1994 issue had a brief review on Office. InfoWorld’s May 1995 issue revisited Office with an opinion piece by Editor in Chief Stewart Alsop. He felt “Microsoft doesn’t really care too much for the Macintosh anymore”. Scanned image of Microsoft Office 4.2.1’s retail box (front). Click on the image. Scanned image of Microsoft Office 4.2.1’s retail box (back). Click on the image. Thank you for uploading this, even with those scans. Great! I don’t purchase software packages on Ebay anymore for room reasons. But the retrocomputing scene lives from those purchases and shares. This also helps archiving the software, which really is important. Thanks a lot. Keep up the good work.